Vote on the Home Page to get more money for NMSU Scholarships! The fall 2013 semester was the 17th-consecutive semester that all 17 men's and women's athletic teams have a combined cumulative GPA of 3.0 or better. The cumulative GPA for all men's and women's teams after the fall 2013 semester was a 3.143. "The Wells Fargo Academic Honor Night gives the Academic Support Program & Services Center staff great pleasure because it provides us an opportunity to celebrate the great academic accomplishments of our student-athletes," said James Hall, Associate Athletic Director for Student Development/Sports Administrator. "They are so dedicated to their educational and athletic endeavors and it's great that we get to showcase their achievements to the university and Las Cruces community." The NM State Athletic Department is proud of its 13 student-athletes who have maintained a 4.0 cumulative GPA throughout their career. There were also a total of 33 student-athletes who earned a 4.0 GPA during the 2013 fall semester. After the 2013 fall semester, 66 percent of NM State's student-athletes carry a cumulative GPA of 3.0 or higher. A total of 276 student-athletes representing all 17 sports programs earned a 3.0 or better during the 2013 fall semester. The 2013 fall commencement on Dec. 14 included 25 student-athletes who are now proud alumni of NM State. The 25 graduates exemplify the outstanding academic accomplishments by the student-athletes as their cumulative GPA was slightly above a 3.00. Their discipline of study ranged from criminal justice, chemical engineering, marketing, community health, management, hotel restaurant management, education, history and biology. In fact, 70 percent of the total student-athlete population graduates from NM State (cohort 2002-2005). 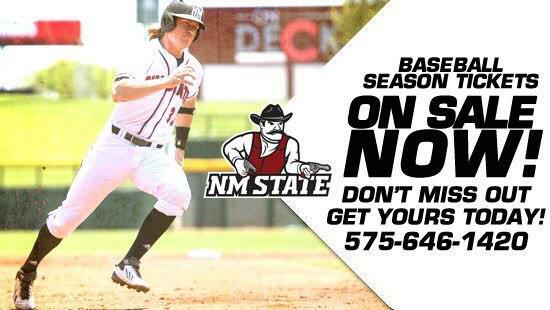 In addition, Alex Newman (softball) was selected as NM State’s Female Scholar Athlete for Fall 2013 Commencement and Ryan Beck (baseball) was selected as NM State’s Male Scholar Athlete for Fall 2013.